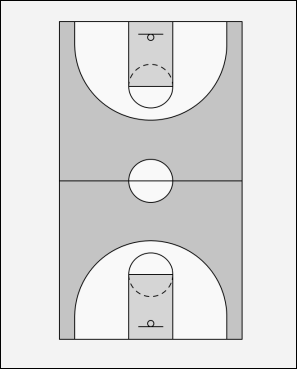 Drill starts with 3 players at center court 2 players at each basket playing defense in tandem and 4 players off the court at the foul line extended on each side of floor. The drill starts as a 3 on 2 fast break. The man with the ball stop hops at foul line then slides to whichever side the ball is passed for a return pass and possible shot. The back defensive man stops man that receives pass. The top defensive man forces man with ball to give up the dribble then falls back to prevent cross lane pass. The object of the defense is to create the turnover or force the shot from outside. The object of the drill is to teach passing, ball handling, defense as well as conditioning. Adjust the drill to the way your break is played.